*A new video of Mayor Rob Ford popped up Tuesday that shows him cursing and slurring his words – this time in what appears to be a Jamaican accent. 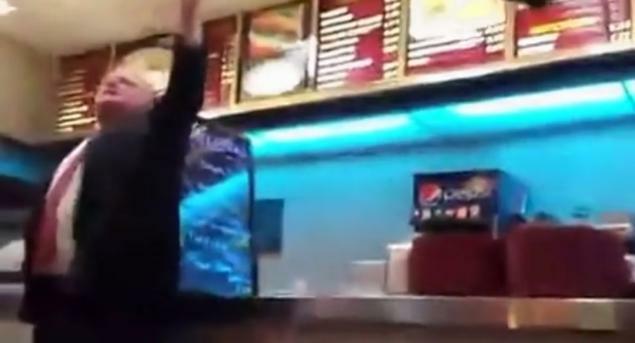 In the video — one of two new ones that have been posted on YouTube — Ford is shown in a fast food restaurant rambling and talking about police surveillance and calling police chief Bill Blair a derogatory name. Ford, who said in November that he quit drinking, said outside his office Tuesday that he drank on Monday night “a little bit” and acknowledged it was him in the video. When asked if he also did drugs, Ford said no. Ford said he did not think the language he used was offensive or discriminatory. “It’s how I speak with some of my friends,” he said. “Chase me around for five months,” the mayor says in the video. “Leave me alone . and then try and tell me, we’re counter-surveilling the guy. He’s hiding here, I’m hiding here. Oh, we don’t know?” he says before rambling incoherently. Mark Pugush, a spokesman for Police Chief Blair, said they don’t respond to personal attacks. A second video of Ford posted on YouTube and from inside the same restaurant, appears to show Ford sitting with his friend and former driver Alexander Lisi. Lisi faces trial on drug and extortion charges after police started an investigation into the mayor. It was not immediately clear if the video was also shot Monday night. Deputy Mayor Norm Kelly, who assumed some of the mayor’s powers after the City Council stripped Ford of many of his duties year, urged Ford to seek professional help. “He’s got to do a lot of soul-searching in the next few days,” Kelly said. Ford said in November that he was finished with drinking alcohol after having a “come to Jesus moment.” He snapped at reporters and denied he was drinking after pictures emerged last week of him at a night club. Ford vowed in November that the public would never see a tape of him intoxicated again. He said he was working out and the mayor noticeably lost weight. He put his name on the ballot to run for another term earlier this month. Ford acknowledged last year that he smoked crack “in one of my drunken stupors” after police said they obtained a copy of a tape that appears to show him smoking crack. He refused to resign. The City Council stripped Ford of most of his powers but lacked the authority to force him out because he wasn’t convicted of a crime. The mayor was the subject of a police investigation but was never charged. According to police interviews, staffers accused Ford of frequently drinking. City councilor Joe Mihevc said the latest tape appears to show that Ford has not stopped drinking and continues to be an embarrassment to the city of Toronto. Thompson said the mayor’s interpretation of “supposedly being Jamaican” was offensive. He called it a sad day and said the mayor needs to seek help. City councilor Denzil Minnan-Wong said Ford had been doing well lately but said this is clearly a setback for him. “It looks like he’s fallen off the wagon,” Minnan-Wong said.